So you (or your kid) have just graduated from university – or high school. Congratulations! A new direction, a new career and a new experiences are on the road ahead. And, the Vickar Automotive Group has some incentives to make it easier to get on that road. Vickar Community Chevrolet is prepared to give you as much as $1,000 off the purchase of a new model – depending on the make – and up to $500 off a used model. “We have a very good program,” says Vickar Community Chevrolet new car sales manager Don LaChance. And you can possibly combine your Vickar discount with General Motors’s own student discount of $750 off most new vehicles. For those students who may not want to tie up money in a long term loan – maybe you are still trying to get out from under a hefty student loan – leasing is also an option. Among the advantages – you don’t have to put any cash down and no previous credit experience is required. You can get leases for 36 or 48 months; and Vehicle lease payment, including taxes, cannot exceed 25% of gross monthly income. You would need proof of employment or an employment start date – plus a description of your employment position - before first lease payment is due. The Graduate Lease program, subject to approval from GM Financial, is available to graduates for up to two years after they graduate. 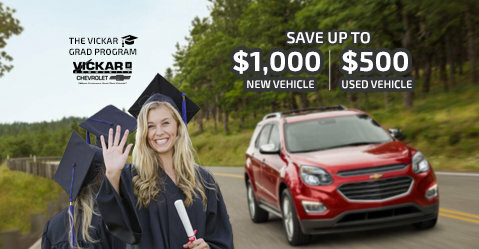 For more information on the GM Student Bonus or the Graduate Lease program, and to know if you are eligible, please contact us at Vickar Community Chevrolet today.